On this week’s show hosts Andrew Eisen and E. Zachary Knight talk about Nintendo president Satoru Iwata’s health and being reelected by the company’s board, a bunch of topics related to Electronic Arts, and whether Microsoft should bother selling the Kinect separately from the Xbox One. All this and more awaits in the latest episode of the Super PAC. Download Episode 104 now:SuperPAC Episode 104 (1 hour, 13 minutes) 84.1 MB. As always, you can subscribe to the show oniTunes and use our RSS Feed to add the show to your favorite news reader. You can also find us on Facebook, on Twitter @SuperPACPodcast and Google +. You can send us feedback on the show by dropping a note to superpacpodcast@gmail.com. We held an impromptu live episode of Super Podcast Action Committee to sound off about the good, the bad, and the ugly of the Electronic Entertainment Expo that ended on Friday. What better day than Friday the 13th is there to do a podcast? What could possibly go wrong? Find out by watching this video of the show featuring hosts Andrew Eisen and E. Zachary Knight. In Episode 59 of the Super Podcast Action Committee, hosts Andrew Eisen and E. Zachary Knight talk about the latest GamePolitics polls, Don Mattrick jumping from Microsoft to Zynga, a teen jailed for Facebook comments, and a whole lot more. Download Episode 59 now: SuperPAC Episode 59 (1 hour, 2 minutes) 57.2 MB. In Episode 54 Andrew Eisen and E. Zachary Knight talk about the latest GamePolitics poll, what all they would like to see from all the big publishers at E3 next week, and the stance of two publishers on DRM. Download Episode 54 now: SuperPAC Episode 54 (1 hour, 3 minutes) 58.5 MB. As always, you can subscribe to the show on iTunes and use our RSS Feed to add the show to your favorite news reader. You can also find us on Facebook, on Twitter@SuperPACPodcast and Google +. You can send us feedback on the show by dropping a note tosuperpacpodcast@gmail.com. In Episode 52, hosts Andrew Eisen and E. Zachary Knight talk about females presenters at Microsoft’s Xbox reveal event this week, EA’s continued abuse of the Wii U community, The new S.H.I.E.L.D TV series, Wreck-It Ralph, sushi, and other topics and tangents – mostly instigated by Andrew! Download Episode 52 now: SuperPAC Episode 52 (1 hour, 12 minutes) 66.7 MB. 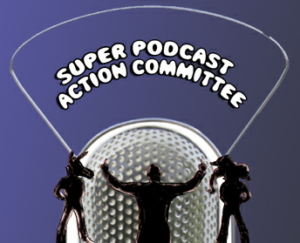 In Episode 28 of the Super Podcast Action Committee hosts Andrew Eisen and E. Zachary Knight discuss the importance of voting, Microsoft’s bad Xbox 360 press event in Israel, and a dumb patent designed to count how many people are watching licensed content from a console (so they can charge more money, we assume). Download it now: SuperPAC Episode 28 (1 hour, 18 minutes) 69.6 MB. Now, I don’t have a 360 and cannot easily verify this, but reports are coming in that XBox Live Indie Game developers are finally getting the promotion in the Dashboard they have been clamoring for for years. There is now a first page shortcut for Indie Games within the games tab of the 360 dashboard. This is something that many indie game developers have requested for as long as the program has existed. This is also a contrast to the history of the indie game section. It seems that every time Microsoft made an update to the 360 Dashboard, the indie game section would be pushed off into some new obscure hole. It was never in the same place and almost always buried within multiple unintuitive menu options. This is the first time it has ever been listed along side Arcade and On Demand games. Is this a new dawn for indie game developers or will this end up being only a temporary reprieve from obscurity? We won’t know for sure, at least not for a while. But let’s hope that this new placement will stay for the duration of the 360.